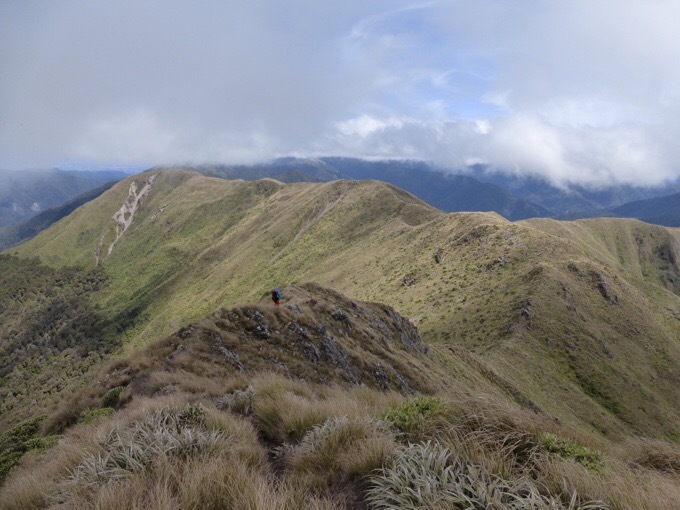 Today was the big day with the push to get over Mt Crawford before inclement weather moved into the Tararua Range. Our goal leave time was 5:30am and we managed to get out at 5:50am, so that wasn’t bad. Neither of us slept well with so many in the hut last night and a lot of noise. 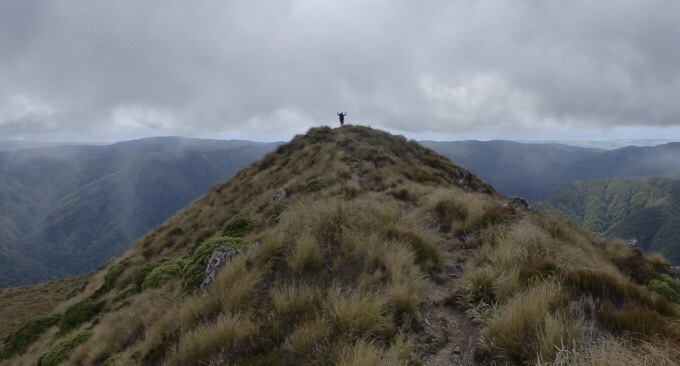 The whole day was some form of ridge walking both above and below tree line with plenty of mud and tussock to add to the fun for the first part. It was quite steep up the first ridge, but it was rewarding in scenery. The first ridge we went up. We had great weather with just a slight breeze, and our jackets were off within the first 15mins of leaving the hut. 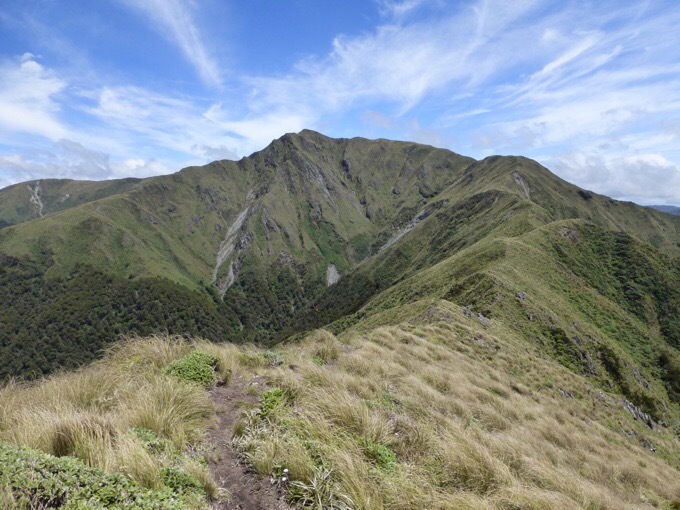 That’s super rare for being so high up in the Tararua Range. We knew the clouds, dropping temps, and high winds were on the way later today, and kept a focused pace. I need to send a big THANK YOU to my friends Buck-30 and Why Not, who have online journals from each of their TA thru-hikes. 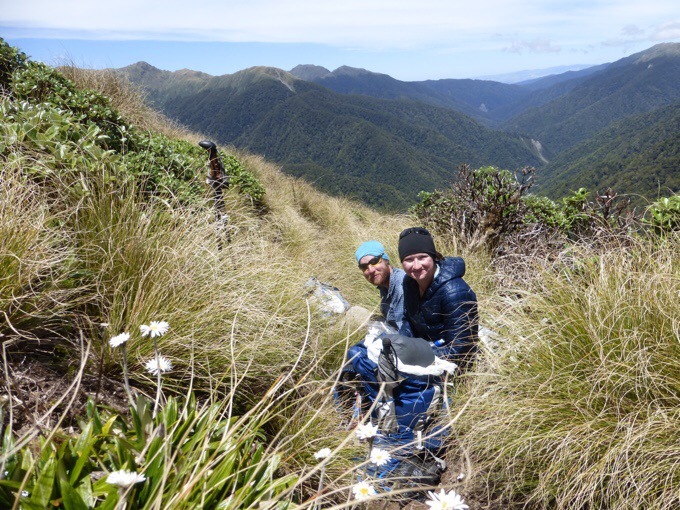 Both gave detailed timing for the Tararuas, and that was instrumental in our planning for making it over Crawford today. We probably wouldn’t have timed it right if it wasn’t for their beta. 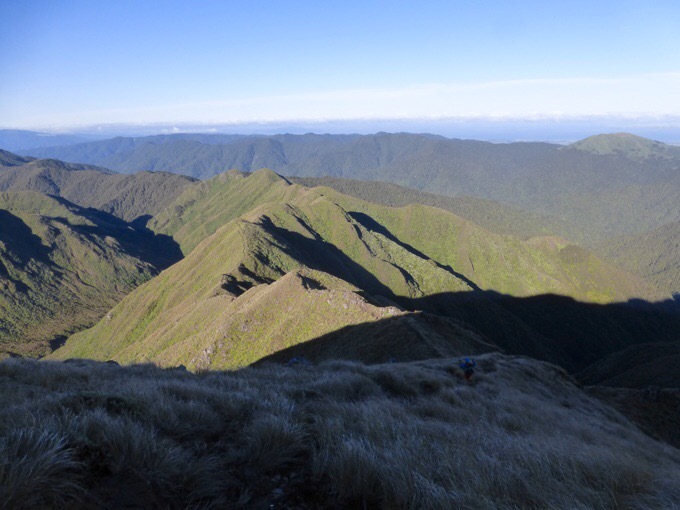 Looking back, Te Matawai Hut is visible at the highest point of the shadow. Soon after we left Te Matawai Hut, we saw a sign that told us we were just 6hrs from Nichols Hut, the hut just before Mt Crawford. In New Zealand, most signage is labeled with times, because with the slow terrain, distance is irrelevant. We tend to go 20-30% faster than these signs, and were excited because that was less than the estimate we had from Buck-30 and Why Not. 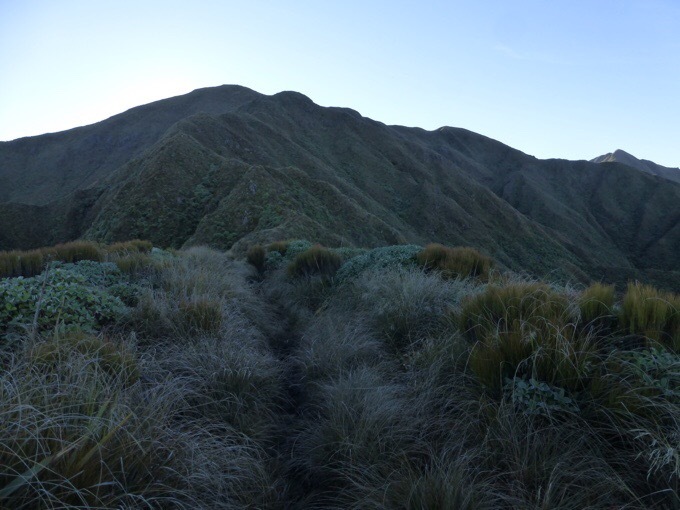 Then we climbed to another junction over an hour later to have the signage say that it was another 6-7hrs to Nichols Hut. That is terrible signage and really not safe. Fortunately, we are in condition to adjust for that, and we had other beta that gave us a heads up, but it was a mental punch to see that sign and feel like we had moved backwards after over an hour of hard climbing. We continued on a couple of ridge lines above tree line to Dracophyllom Hut. 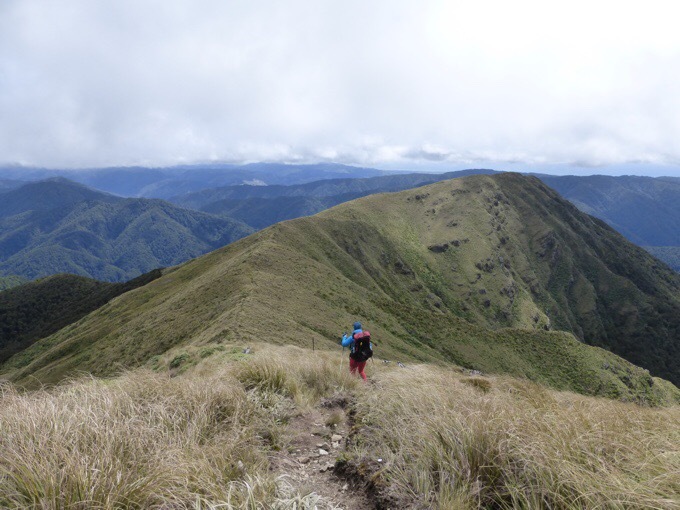 It was fun to finally be on this kind of hiking, and cool to clearly see the ridges we’d be following. 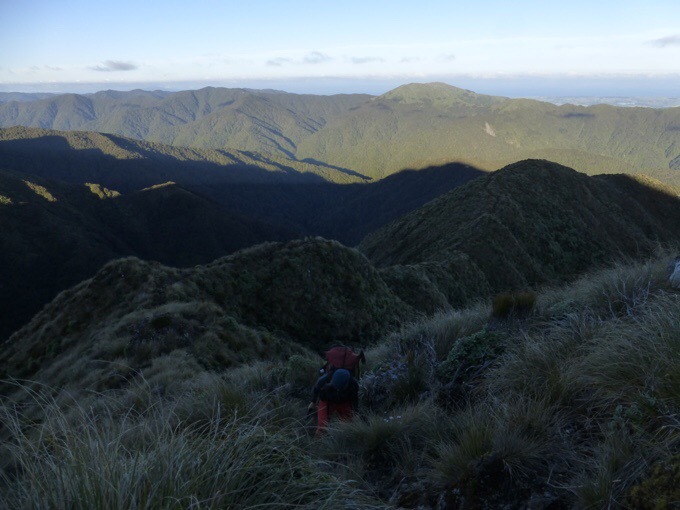 Last night, since the weather was so nice, Bill, Emily, and Flo decided to push on from Te Matawai Hut with the same goal of getting over Mt Crawford later today. They figured they’d do it better last night than getting up early today. We were definitely slower early this morning for the first couple hours till our bodies really woke up to what we were doing, but we were happy to not have moved on last night. It ended up taking us 3hrs 45min (with a short break) to go the 4.5mi/7.2km from Te Matawai to Dracophyllom. The group didn’t get to Dracophyllom Hut last night, and ended up camping in the exposed area each finding spots right on the trail just barely doable. 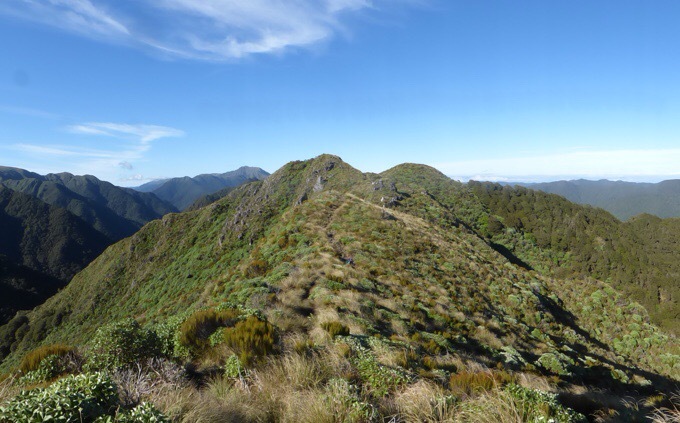 It’s rarely that nice in the Tararuas to be able to do that sort of thing, and it isn’t recommended, but I wanted to mention it was doable if you have to in ideal weather for future hikers. We ran into Flo as he was packing up and caught up to Bill and Emily when we reached Dracophyllom Hut for our early lunch and their breakfast stop. They were leaving just as we arrived and we saw them on and off later in the afternoon. Flo had a meal with us, but we didn’t see him after that, and he didn’t make the push over Crawford. We all came in with extra food knowing this weather was coming and prepared for a zero or two in a hut if needed. The hiking from Dracophyllom to Nichols was a combination of exposed and wooded ridge hiking. Early on, we could see Mt Crawford and the ridge line we’d be following. Mt Crawford and the ridge we’d be hiking to get there. It was a tiring day, and has been a tiring week. 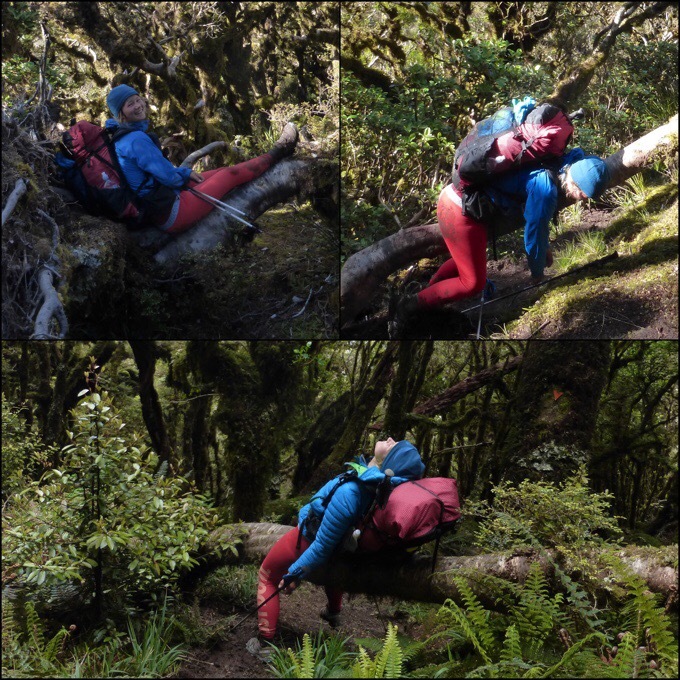 There were many fallen trees in the beech forests to hurdle, and there were many times that mid-hurdle, Becky realized how convenient they are for a brief rest. My favorite of the the collage is “sloth Becky.” The last one was at the end of the exhausting day. It took us 2hrs 40mins to go the 4.9km/3mi from Dracophyllom to Nichols. 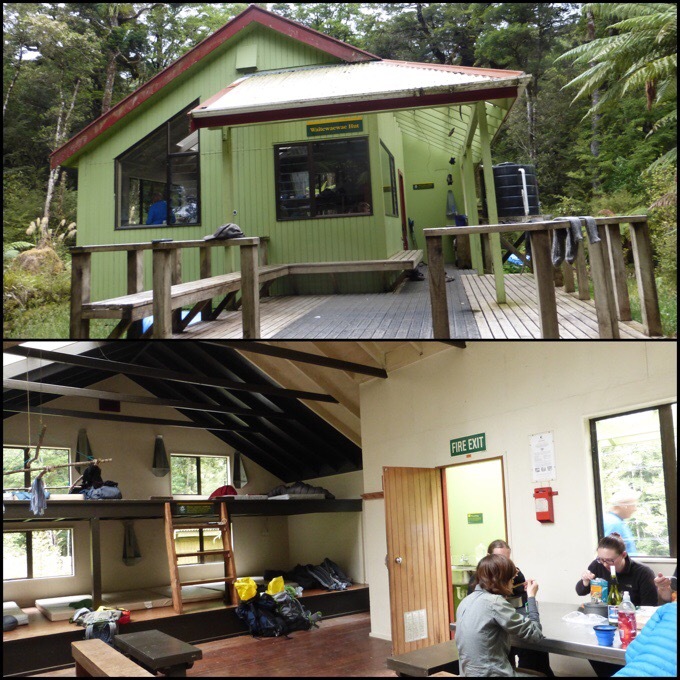 When we got there, we completely understood why most make this their endpoint for their second day in the Tararuas. 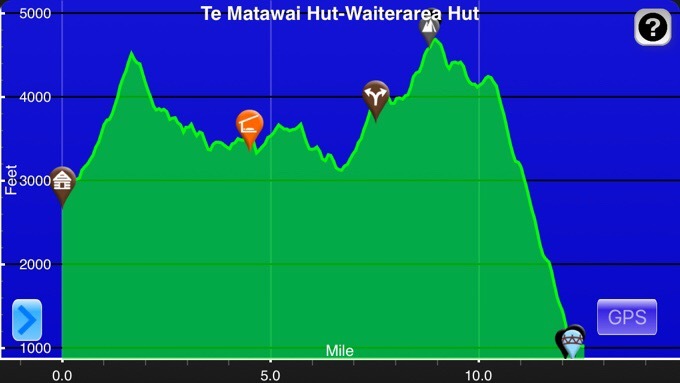 The next hut, Waitewaewae Hut, is a monster of a climb and descent away, and no one would want to add that on to the day coming from Te Matawai unless they were pushing, like us, to beat incoming weather. By the time we reached Nichols, we were pretty tired, and the short side hike down steep rocky terrain to the hut was daunting. We just needed water, so Becky, Bill, and Emily found a great sheltered warm spot to eat something at the junction, and I went down to get the water. It was a tiring side trail for sure. Looking back as we reach Nichols Hut. After eating a bit, we took off for Mt Crawford. It was 1:30 when we left from Nichols, and the forecasted weather was moving in quick. It was really windy with clouds coming in, and it was getting colder. Becky killed it up the climb and we did the steep 1mi/2.3km (signed to take 2hrs) in 50mins. That’s the motivation of weather for ya! Becky far on the ridge up to Mt Crawford. Even with the high winds, we took the time to take it in and take some photos. 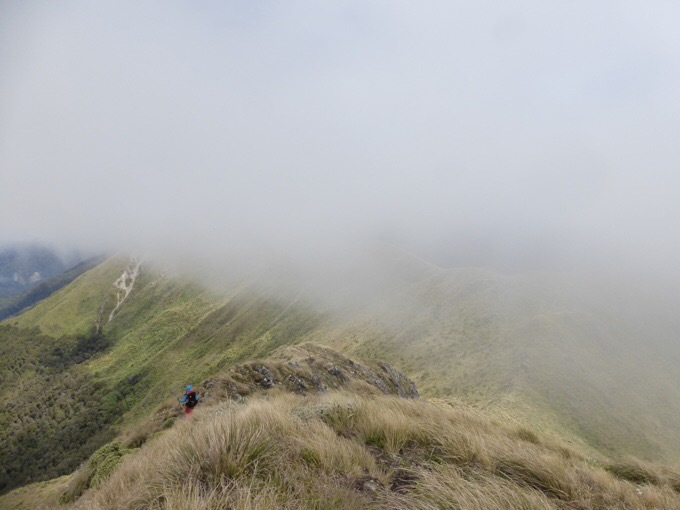 As we descended, the wind was so strong on the first ridge that it was challenging to stay upright and my hiking poles were shaking in the wind. The clouds were moving in fast, and there would be a clear view ahead one second and then completely obscured the next. It was pretty cool and fun since we knew the hard part was over, and we were heading down out of the wind. We totally nailed it, and I’m so glad we threaded this needle! This weather is apparently a major storm that’s moving in on New Zealand, and it will make getting over Crawford dangerous or not doable for the next two days. We made it just in time. Clouded ridge down from Mt Crawford. Same ridge just seconds later all clear. The “fun” wasn’t over yet. We still had the steep drop of 3,776ft/1,151m over the next 3.5mi/5.7km. It started off gradual with a couple more exposed ridges to walk. It started to get warmer so we could delayer. I took off my beanie to realize my sunglasses were gone, ugh! 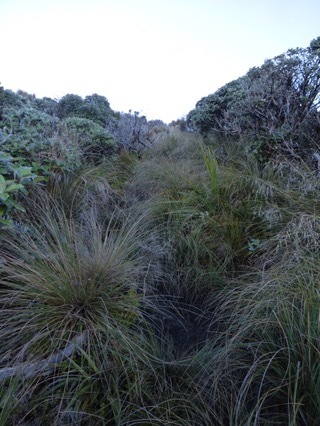 About 20mins earlier, I had stepped in a hidden divot in the tussock and rolled my ankle a bit and went down. I was fine, but must have dropped the sunglasses then. I hoped Bill and Emily would see them, but when we saw them later they hadn’t. Dang! That’s the third pair this trip! Two lost and one broken. Becky and I are in a challenge to see who has to replace the most of one item. For me, it’s the sunglasses. For Becky, it’s headphones. Ugh. Next up, the nose dive down into the forest began. Our legs were jello from all the ups downs today, and felt like they might give out at any moment with how steep it was. The good news is that it was the first dry forest we’ve been through in ages. However, this descent was a killer. It was super steep and slow going stepping around roots and rocks with almost each step. It was like when you do workouts in the gym and you squat halfway and hold it to feel the burn before standing up again. Well, do that with a pack on after a full day of steep hiking. We passed Yoko on the way, a very sweet hiker we’ve overlapped with a few times before. It felt like an eternity and the steepest part lasted well over an hour. 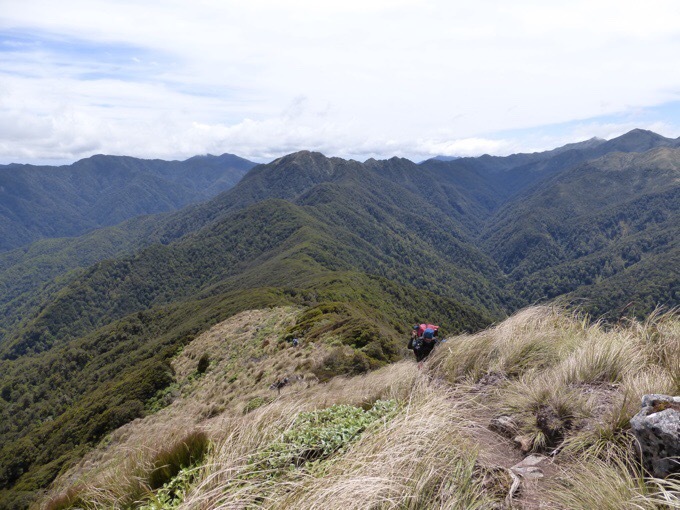 It took us 2.5hrs to do the final 3.5/5.7km from Mt Crawford to Waitewaewae Hut. We arrived at the hut at 5:15pm, just under 12hrs for the day. The Tararuas ate Becky’s shoes. A very creepy and swaying see through suspension bridge. The Waitewaewae Hut is a very nice and spacious hut. It holds 18 people, but can hold much more if needed. There were three other couples, us, and Yoko inside. Bill and Emily chose to tent. We all are really tired, and I almost pitched outside as well to ensure a better night of sleep, but rain is forecasted, so I decided against it. Everyone is super nice and respectfully quiet. I think we all are tired, and it doesn’t feel like New Years Eve at all. Becky fell asleep at 8:15pm, and I went to sleep at 8:45pm. It was quite a challenging and tiring day to pull out that much in one day on the terrain we had, but it was worth it to have made it through this weather window and avoid being holed up in a hut for a zero or two waiting it out. The total for today was that we did 12.5mi/20.1km with 4688ft/1429 of ascent and 6566ft/2001m descent on rough terrain. I am proud of Becky for pulling it out knowing this is all new to her. This kind of hiking is more what I feed off of, and it was even tiring for me. What a way to close out 2016! Happy New Year everyone! the further you get into the mountains the rougher and rougher the trails get, till often theres no cut trail. the times on the signs as you get further into the mountains change as well. the further into the mountains you get, the fewer unfit, inexperienced people are willing to take on the longer rougher tracks, so the sign times change to being orientated for the standard NZ tramper who is generally pretty fit, by the standard of the average overseas trampers i’ve come across, they are fitter than the overseas trampers. 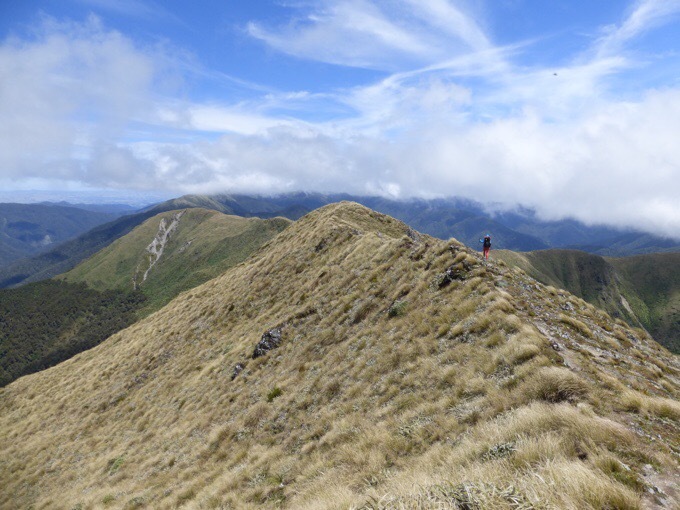 some of the best mountaineers and mountain runners come out of NZ because, really rough mountain trails are the norm, if you want decent hiking then you have to do rough trails or you just don’t hike much. 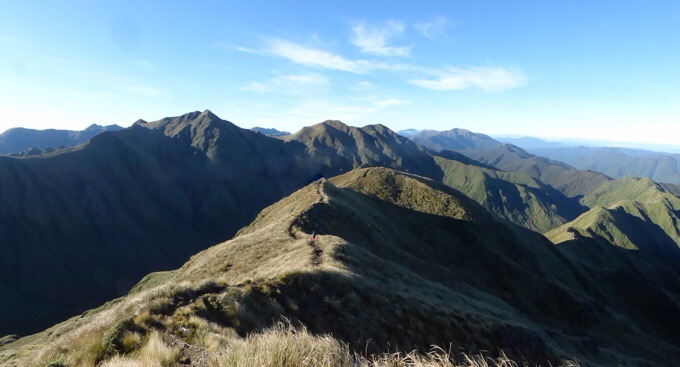 The tararuas gets run from end to end regularly in 24 hours and that includes some women and under, latest record is 18 hours. Yeah, it packs quite the punch for sure. Hey Wayne! 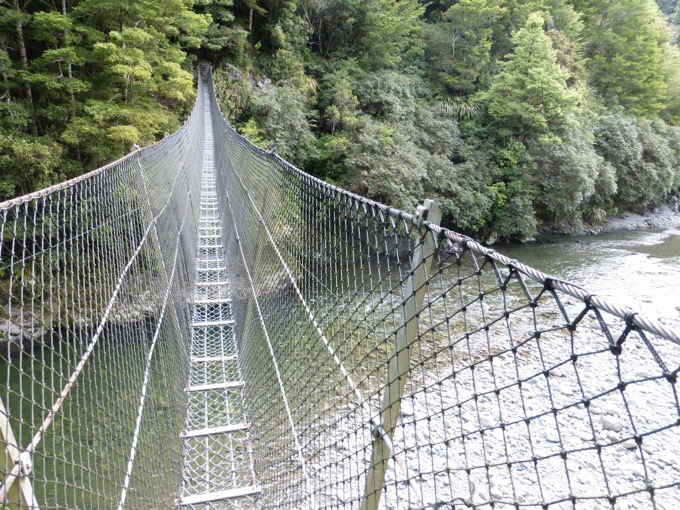 Do you know why the TA is mostly walked by overseas trampers than kiwis? I have been told (correct if wrong) that NZ have 4millions people + 2millions overseas tourists. Wondering why TA has so little interest with kiwis ? 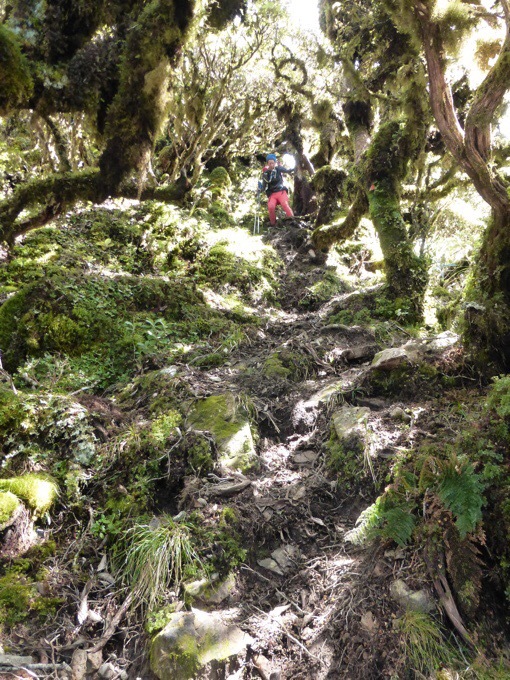 most foreigners wouldnt like the rough trails where kiwis go, we grow up on rough trails, theres nothing that bad about them to us, we are used to them and dont have a problem with them. we can tend to find well maintained trails boring because we are used to the stimulation of walking over rough trails, and most of them are rough. problems are creeping into the TA. 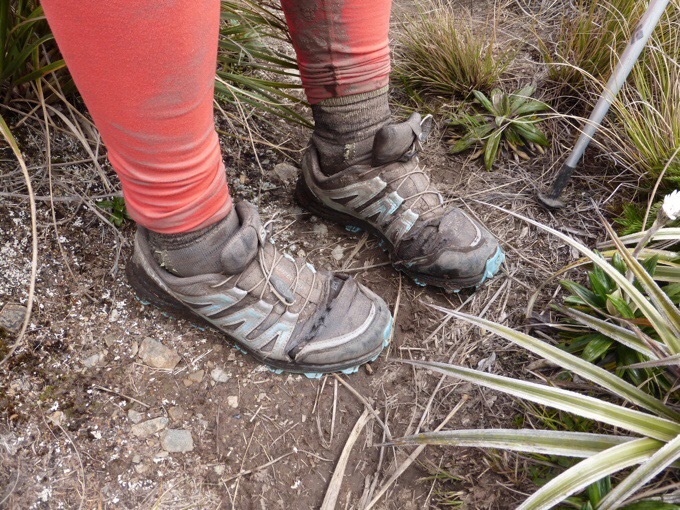 not all TA walkers use good track etiquette, specifically some huts along the TA have more problems around how people dispose or don’t dispose of their waste including their no 2’s correctly, there’s some disgusting messes around, its pretty rare for NZ trampers to behave like that. so some of the foreign TA walkers are creating a bad name for the TA and NZers will avoid it. as noted not everyone on the TA is a true through hikers, there are lots of cherry pickers who are more people who normally are staying at back packing hostels and they dont all have the same ethics about how to behave in the outdoors, people doing short days who are full of energy and stay up late making a lot of noise, thats not the way NZ trampers behave. I agree with that. It’s far too crowded. Tx Wayne and Paul for thoses precious informations. Tx to Wired for letting ‘blog outsiders’ add informations/opinions. Last question to Wired…do you think TA hikers behave badly compared to hikers on the AT,PCT,CDT ? It depends I guess. One bad apple can spoil the bunch. 90% of the ones I’ve met have been great on all trails. My guess 300 max but maybe 100 walking the whole thing. All the locals here tell us they know not to walk it, cause it’s for $$ for NZ tourism and doesn’t even go to the good parts. That it intentionally goes to the lesser traveled destinations to spread out the tourists from the more well traveled destinations. Hey Wired. I’ve been watching your progress with interest. I’m in Levin and thought about popping up to Te Matawai to help you out if you missed the weather window. 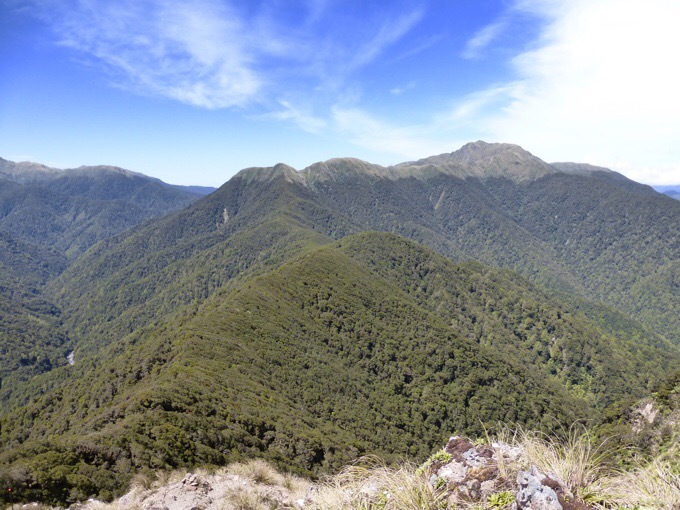 Also from what I saw of your previous blogs I could tell that the Tararuas were going to be a bit of a change too. You did a great tramp from TM to YTYY. Well done. I think that your information that TA goes intentionally to lesser visited destinations is true to a limited extent. The TA ended up on a significantly different trail than initially intended. I’ve talked to a couple of the guys who did the initial hike and the route is what it is because it needed to take in certain elements, but beyond that was deeply affected by access issues. 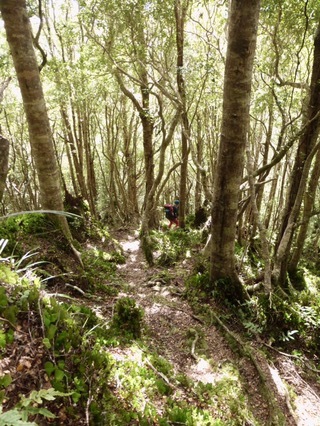 NZ doesn’t have extensive legal hiking access through the private properties that border many of our forest parks etc. There are a few properties whose refusal to allow access have added many tens of kilometres of road walking. Again, well done on threading that needle. Great effort. Patrick I’d add to Wayne’s comments that the number of kiwis who actually access TA is limited because Tramping (as hiking is called in NZ) isn’t a mass participation activity. I would say that less than 1% of NZers regularly access the hills. Those that can afford to take 3 months off to walk the length are perhaps a few % of that, spread those out over being able to do it at any time, not ina given window or year and you have probably only 50 – 100 NZers a year doing the length of the trail, and they, as Wayne points out, are likely to do it at less busy times. 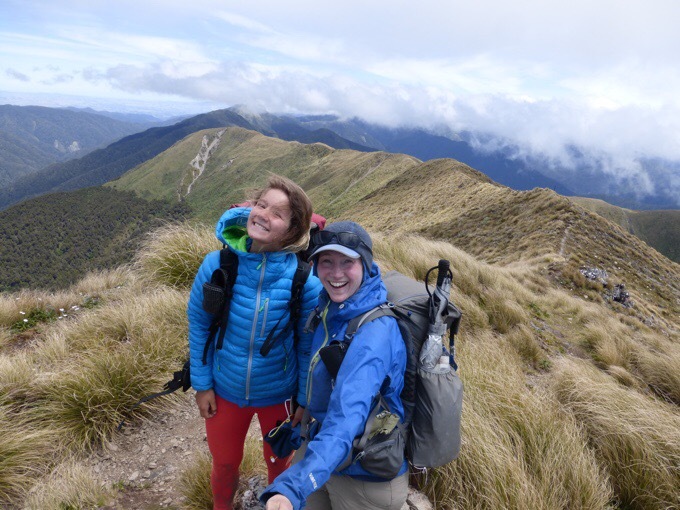 I frequent the Tararuas and regularly run in to TA hikers over the summer. Over the summer in the appropriate huts they outnumber the kiwis often 3-1. 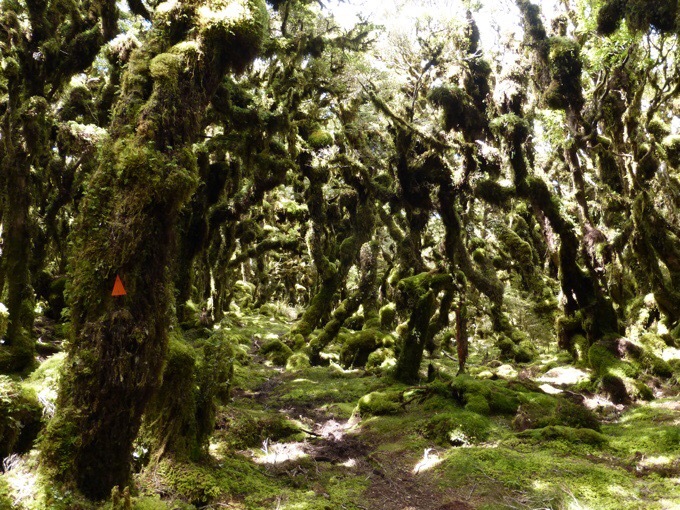 Outside of those peak months, in the same huts, Kiwis outnumber the TA walkers 10-1. Hopefully you’ll have a dryer experience! Well done you for heeding the forecast and getting over the exposed tops. What a mega-effort! Pity another pair of sunglasses have gone west, perhaps a neck strap would be a useful addition for the next pair? Possibly! I had them for the river and should have kept it. I tend to get annoyed with little things like that touching my neck, but it would apparently save some $$. Absolutely stunning photos. What a hike to wind up 2016. God speed. Tramper Wired and Tramper Becky kicked its *ss. So revel in that and don’t let the naysayers take your accomplishments away. The best photo by far is the “Mt Crawford summit!” There is so much energy and happiness in it and for myself and the others I truly thank you. It gives me a real lift here in SoCal where it isn’t sunny right now. I was expecting that after I read how arduous it was today that you two would have hiked 20+ and to hear it was only 12.5, wow, it was truly a hard day. Congrats on the accomplishment of a long hard day. Yeah, that short of a distance does feel like we’re inching at times. I seem to be on a string of home zeros.. what a hike you are having! That bridge looks familiar, probably from Why Not’s hike and blog. Definitely no sun in SoCal today. Tomorrow I will be back on the road taking a person to chemo or a scan and hopefully I will see snow on the San Gabriels.. tge snow is there, just hope I can see it.